The audience has a hushed silence hanging about it…the kind of silence that you only hear with baited anticipation holding everyones’ breaths deep within them as individual excitements mount to create a palpable collective and universal thrill as what lies in store. The heavy auditorium curtains give little away as the audience’s excited anticipation reaches fever pitch. Then…the curtains begin to slowly open and commence their seemingly torturous slow journey to reach their destinations at either side of the impressively large stage. Slowly the heavy fabric sleeves holding their secret are opening with a come-hither look of seductive prowess about them to reveal what the whole auditorium have been waiting for…no other than the Cooking Duo! Yes, foodies! Live, on stage! With each beaming the widest of smiles and waving cheery greetings of “Hello, fellow Foodies!” to everyone gathered here to see and watch this dynamic Cooking Duo’s show. Dawn: Well Andrew, what do you have for me today? Andrew: I’ve been busy in the Love Food garden, Dawn. Have you seen the size of my marrow? Dawn: (raises eyebrows) My! That’s an impressive size! Andrew: The more it’s loved, the more it grows! Dawn: I don’t wish to know that! But what to do with the beast; it looks a real monster! Andrew: The marrow is from the same family as courgettes, but unlike its smaller cousin, it is an advantage to be this size. Dawn: It’s about 15 inches long. Should fit nicely into that baking tray. Andrew: Marrow is delicious, nutritious, easy to grow and cook. However, the taste is often quite bland. Dawn: Shall we spice it up a little? Andrew: You know I can never decline an invitation like that! Andrew: Definitely going to be a kick from this combination. Dawn: Let’s get this party started! Cut the marrow in half, scoop out the seeds and the flesh leaving about a centimetre depth in each half. Season with black pepper and salt, and place in a baking tray. In a heavy bottomed saucepan or frying pan, heat a tablespoon of any type of cooking oil – sunflower, olive or rapeseed oil – over a medium heat. Sweat the onion for 5 minutes, then add the peppers for a further 5 minutes, allowing them to soften. Add the garlic, herbs and spices. Mix well. Add the chorizo and continue to cook for a further 5 minutes, allowing the flavour and colour to develop. Throw the tomatoes in (whole or halved depending on taste). Pour in the wine or water, cover and allow to cook for a further 10 minutes until the tomatoes have split and the liquid reduced. Turn off the heat, add the couscous, mix and cover again. The couscous will cook in the liquid and absorb it. Spoon the mixture evenly into the halved marrow. Cover with tin foil, place in the oven and bake for half an hour. 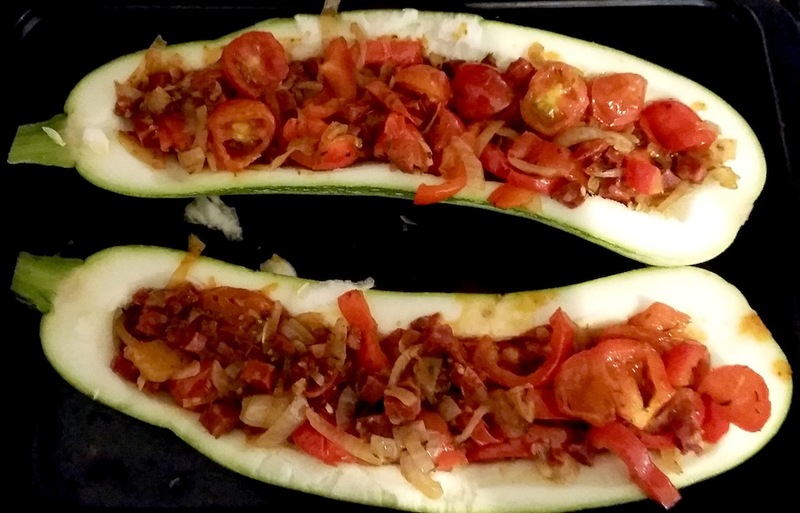 Remove from oven, discard the tin foil, and sprinkle the breadcrumbs and cheese evenly across the marrow. 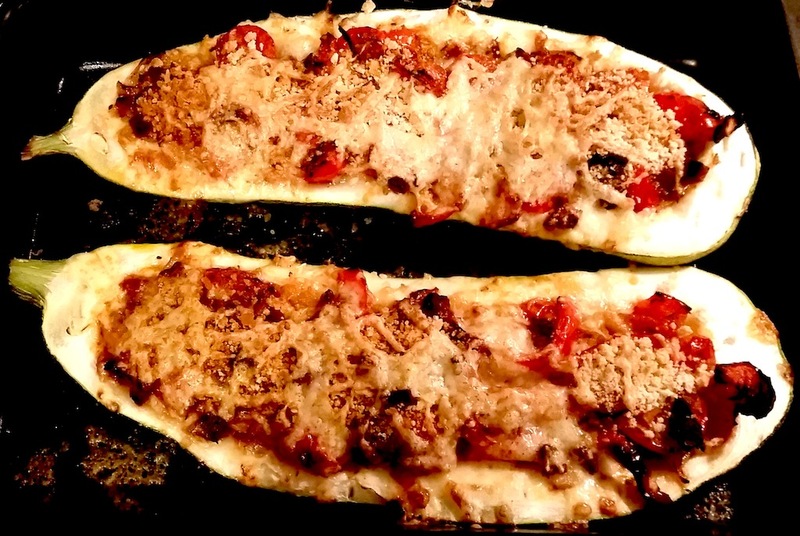 Cook for a further 10 minutes, until the cheese is melted, the breadcrumbs toasted, and the marrow is tender. Serve with a salad of your choice, with chicken or lamb if hungry. Andrew: Half of one of the halves will be sufficient for a lunch. Dawn: And cold the next day, the spicy flavours really penetrate the marrow. Andrew: Another winner from the Love Food kitchen. Dawn: And excellent use of our home grown vegetables! For more inspiring and easy-to-make recipe ideas from the Cooking Duo, keep following forfoodlovers.wordpress.com and the Twitter feed @Love_Food_UK. Dawn: “Today, fellow foodies, I bring you a ‘funny’ post…funny, because it sure made me giggle this morning! Yes, I know…it’s the simple things in Life!!! Dawn: “Enough! Cut!” As I make a cutting action with my hand. Andrew: “Thank you! Thank you! Thank you! Dahlings…I’m overwhelmed!! !” As he takes another bow. Andrew: “Shucks…sussed again!” as Andrew winks with mirth spread all across his face. Recline on a comfortable location, from which servant can be directed. Direct servant to put kettle on. Remind servant to fill kettle with water. Direct servant to place teabag in mug or teapot. Servant must pour freshly boiled water onto teabag. Andrew pours freshly boiled water onto teabag. Andrew rests for 60 seconds…no more…no less. Order servant to check tea has diffused sufficiently. If this is the case order the removal of the teabag. If not, feel free to cast a withering look. Dawn checks diffusion of teabag…casts withering look at Andrew who robustly never grimaces. Direct servant to add milk to mug. If milk is added to teapot, roll eyes. On cue, Dawn rolls eyes. Servant must bring tea to reclining mistress. Serve with dark chocolate digestive. Andrew serves tea and delicious dark chocolate digestive. Dawn: “Yes, you can get “the staff” if you try!” and winks, laughing a hearty, mischievous laugh. 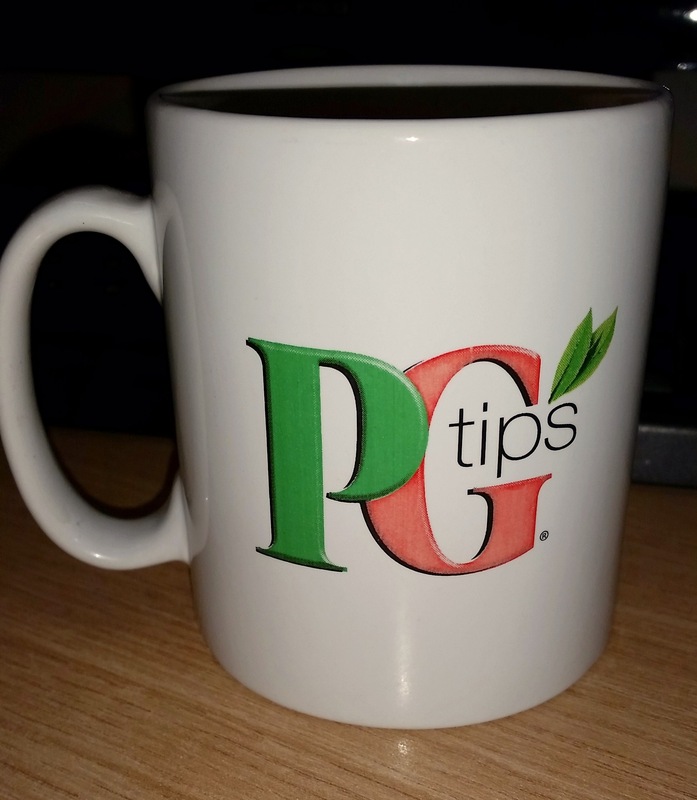 For the perfect cuppa, you’ll just need a good person with a heart of gold, a great sense of humour, a fan to cool the reclining said person with, plus one tea bag and lashings of hot water. For more recipes from the Cooking Dynamo follow @Love_Food_UK on Twitter and follow this blog www.forfoodlovers.wordpress.com. You’ll also find her on Mumsnet Bloggers Network and Foodies100…oh, and did I mention Facebook at www.facebook.com/lovefood.forfoodlovers? See you there for more fab recipes and food chat!